…Here she was, that awful woman, the "beast," as Ivan had called her half an hour before. And yet one would have thought the creature standing before him most simple and ordinary, a good-natured, kind woman, handsome certainly, but so like other handsome ordinary women! It is true she was very, very good-looking with that Russian beauty so passionately loved by many men. She was a rather tall woman (…) She had a full figure, with soft, as it were, noiseless, movements, softened to a peculiar over-sweetness, like her voice. She moved (…) noiselessly. Her feet made absolutely no sound on the floor. She sank softly into a low chair, softly rustling her sumptuous black silk dress, and delicately nestling her milk-white neck and broad shoulders in a costly cashmere shawl. She was twenty-two years old, and her face looked exactly that age. She was very white in the face, with a pale pink tint on her cheeks. The modeling of her face might be said to be too broad, and the lower jaw was set a trifle forward. Her upper lip was thin, but the slightly prominent lower lip was at least twice as full, and looked pouting. But her magnificent, abundant dark brown hair, her sable-colored eyebrows and charming grey blue eyes with their long lashes would have made the most indifferent person, meeting her casually in a crowd in the street, stop at the sight of her face and remember it long after. (…). There was a childlike look in her eyes, a look of childish delight. She came up to the table, beaming with delight and seeming to expect something with childish, impatient, and confiding curiosity. The light in her eyes gladdened the soul (…). There was something else in her which he could not understand, or would not have been able to define, and which yet perhaps unconsciously affected him. It was that softness, that voluptuousness of her bodily movements, that catlike noiselessness. Yet it was a vigorous, ample body. Under the shawl could be seen full broad shoulders, a high, still quite girlish bosom. Her figure suggested the lines of the Venus of Milo, though already in somewhat exaggerated proportions. That could be divined. 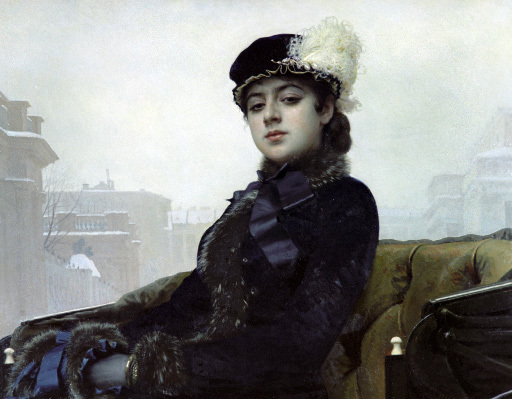 Connoisseurs of Russian beauty could have foretold with certainty that this fresh, still youthful beauty would lose its harmony by the age of thirty, would "spread"; that the face would become puffy, and that wrinkles would very soon appear upon her forehead and round the eyes; the complexion would grow coarse and red perhaps -- in fact, that it was the beauty of the moment, the fleeting beauty which is so often met with in Russian women.